In 1982 a new factory in Stone, Staffordshire, the heart of the ceramic industry was opened and under Gordon, Alan and Peter Smith's management, Dunoon developed a policy of working with numerous designers and artists to constantly update its ranges with new designs and unique mug shapes in both Stoneware and Fine Bone China. 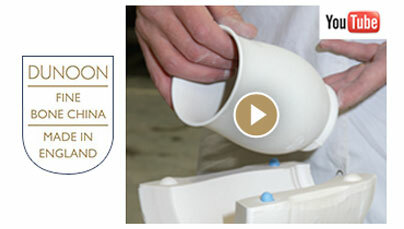 Dunoon uses a traditional slip hand-casting method to guarantee a fine, lightweight mug. Export markets have expanded to include continental Europe, USA, Canada, Australia, and Asian markets such as Taiwan, Japan and Korea. 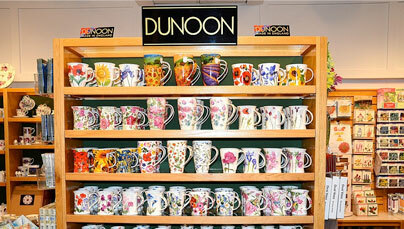 Dunoon is currently supplying mugs to over 60 countries around the world. The growth in popularity of speciality coffee and teas has led to increasing sales and demand for both finer quality and unusual mug design which is Dunoon’s strength. The Smith family tradition of work within the pottery industry, which has spanned over 100 years, continues with Harriet and Andrew, Alan’s children, now involved with the business. Skilled craftsmen and rigorous quality checking is the key to Dunoon’s philosophy of producing the highest quality mugs, well designed in both shape and pattern and manufactured with the greatest care for the discerning customer. Dunoon uses a high quality Fine Bone China clay from Cornwall, South West England which contains 50% crushed animal bone to give the mugs translucency, bright whiteness and strength. 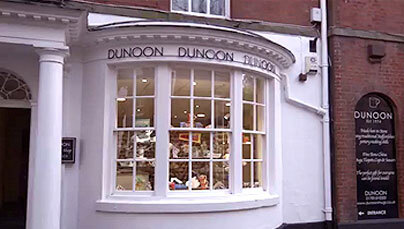 Dunoon uses local skilled craftsmen for each stage of manufacture, many of whom have worked for the company for many years. All Dunoon mugs are inspected and passed with application of the Dunoon shield.